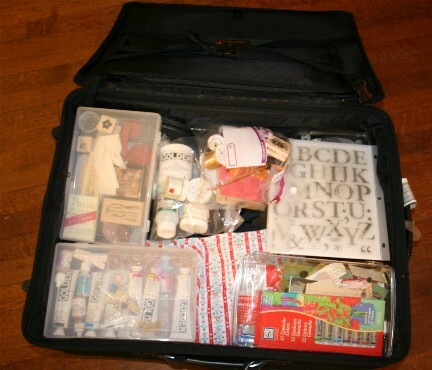 At a bare minimum, I need primaries plus black and white in Golden’s acrylic pant, some brushes, a few rubber stamps and stamp pads, gouache, a rubber stamp alphabet, scissors, gel mediums and some papers and ephemera. This is traveling light. I’m not sure why he doesn’t understand. 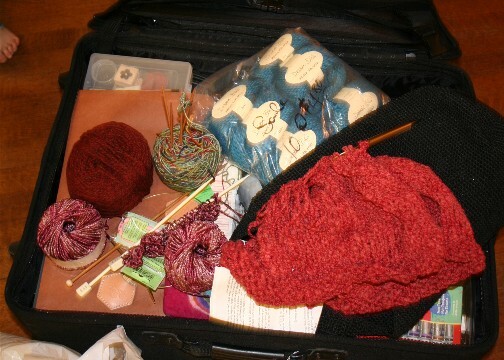 Let’s see — that would be the Muench Touch Me for my Vintage Velvet scarf, the second ball of Peace Fleece for Ollie’s vest, some Colinette sock yarn I thought I might swatch, and the big red blob is Ellie’s Cahaba River Jacket. The blue yarn is the rest of my Clapotis yarn. Let’s just say that I’m being optimistic and bringing it all along. We were told today that they are expecting 12" of snow near one of the schools we are looking at, so I’m preparing in case we get snowed in. I hope I can blog while we’re on the road. I’m looking forward to seeing snow — real snow — for the first time in eight or nine years. I went to college in Maine (Bates) and I still miss the snow terribly. This is so funny and very familar too! Since I’m also traveling right now, but in my car, I have a whole suitcase for art supplies, and I had to make some tough choices!